This is a combined blogpost about my adventures after Đà Lạt and some of it is Not for the faint-hearted, especially going down the Hải Vân Pass without any air left in the rear tyre… and popping it again on the AH1! Now it’s more rainy, but that didn’t spoil the fun. I did some different things this time which was really nice. Although i stayed at the same hostel (Dalat Family Hostel) which is a absolute must-do on your trip to Dalat. They moved locations so now they are able to fit more travelers, without losing the real “family” feeling. 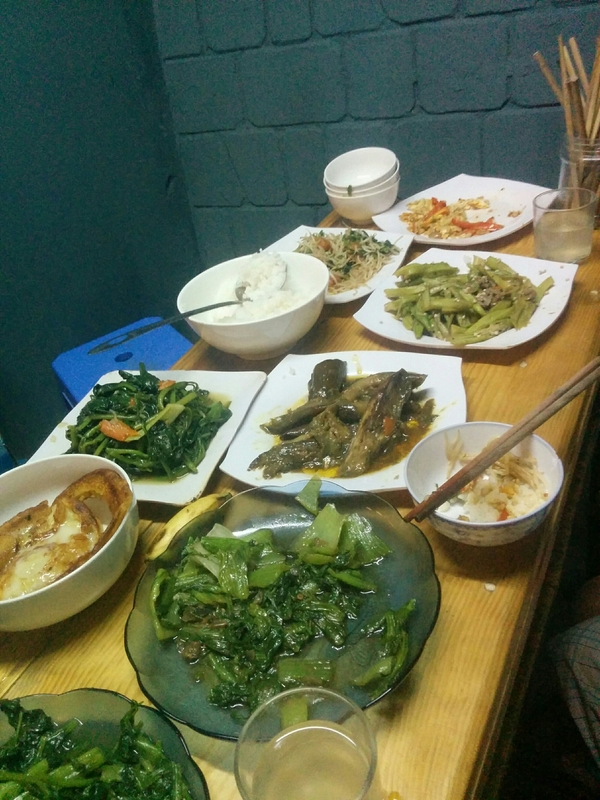 When we arrived Mama Đà Lạt gave us a big hug and immediately ushered us over to the dinner table where there was more food than the actual table could handle. 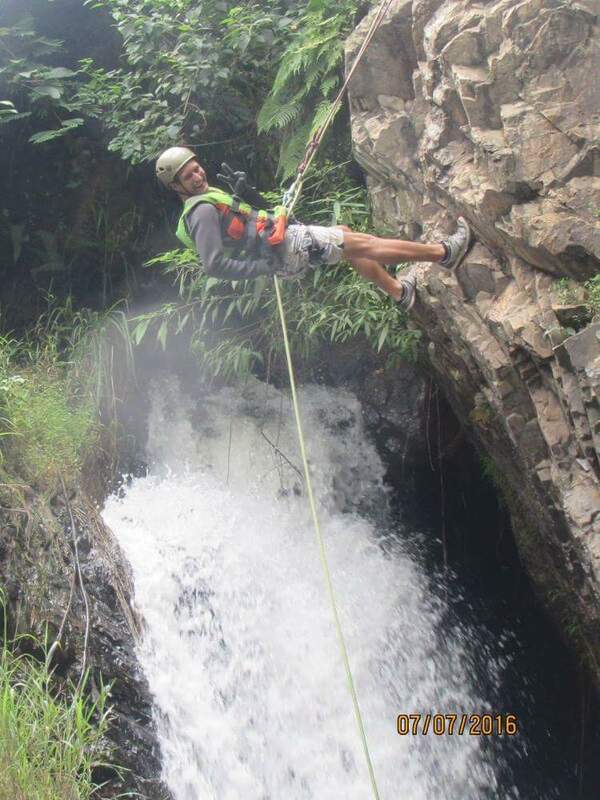 Canyoning, if you have never done this before, it’s really awesome. Basically it’s going down a track in some barren territory (preferably downstream) and on the way down you’ll abseil down some cliffs or waterfalls. After checking all the equipment and getting explaination on how to abseil down the cliffs we set off into the jungle. 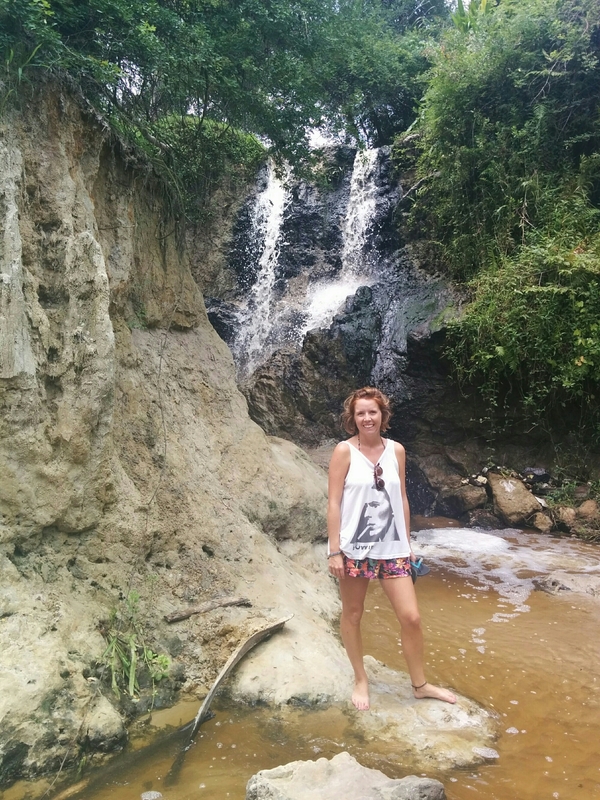 We did three waterfalls in total and a cliff-jump from 7 and 11 meters. There was also a natural water slide along the way. After which we got a mini-van back to Mama and the food was already prepared when we got there, and as per the usual was really lovely and more than you could muster to eat. First off we went into town by foot. That takes about 30~40 minutes but you can see a variety of things along the way, and you’ll get a nice impression of how the Vietnamese people live. 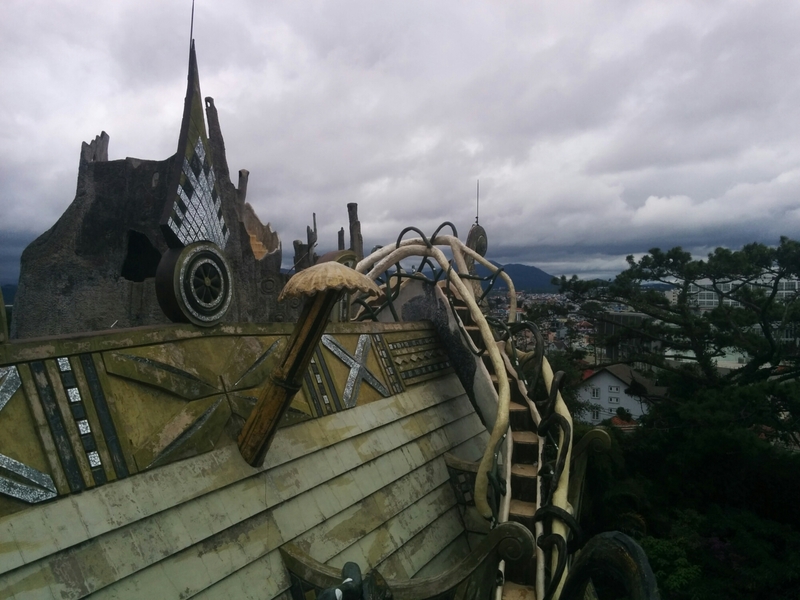 The first sightseeing spot was the crazy house and as the name states, is pretty crazy, really weird architecture. After that we went to the central market for some food and seeing the place bustling with activity. Now we are off to Hoi An via Nha Trang! At the start of the day or the previous night over a few beers i usually plan one day ahead. Prices aren’t fixed and deals are there to be made. The magic word is No thank you. No thanks, I still have to think about it. 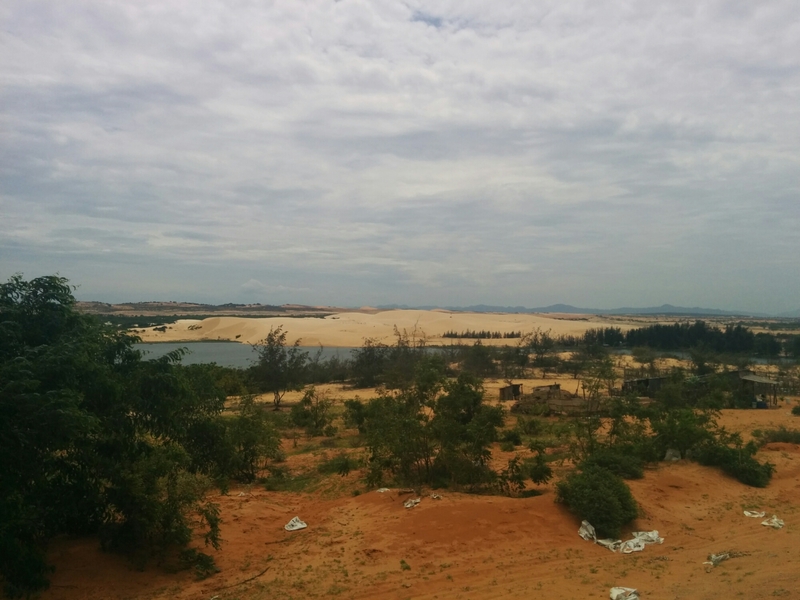 So at the start of the day, me and Anna decided to rent a scooter and go to see the great things Mui ne has to offer. Remember, all rivers and beaches in Vietnam are always free! If somebody is trying to sell you tickets, there must be something wrong (It’s a trap / scam!). Only… there was something new about the road leading to the beach. A fence! But i just scooted onwards and didn’t pay much attention until some guy started yelling and drove after us. Turned out that he was selling… I kid you not… “Swimming in the sea tickets” for VND 20.000 per person! 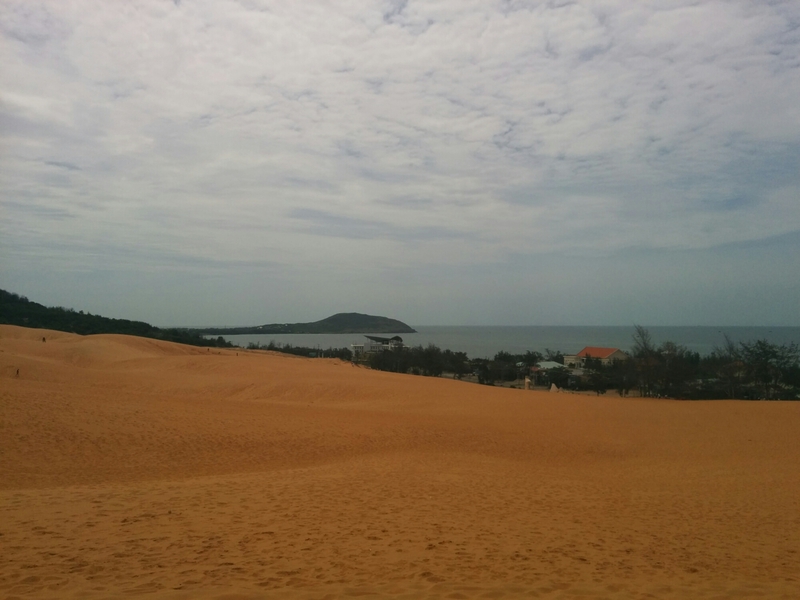 Then the next point of interest: The red dunes in Mui ne. Parking! Parking! Parking! all the guys shouted, park here, park here. Oh no, glass and maybe you’ll get stuck in the sand. “I’ll take the risk” i replied. Without any harm to the scooter we had a nice stroll on the Red dunes. PRO TIP: Don’t rent a sand-sled from the kids, they really don’t really. Better spend that money on the good stuff! Tip 2: Carry a 2nd wallet in case the police stops you. So we were cruising along on our little scooter, when all of a sudden there are 3 guys sitting under a tree. (Uh oh, Police) But just be polite, act nice and nothing will happen. we didn’t do anything wrong anyway and i have my international drivers license. Which is or isn’t valid in Vietnam, i was about to find out. “Drivers license!” he replied! So i gave my International drivers license. After checking my license he switched tactic, you were speeding! 1. you had no laser-gun, only a batton to hit me with. 2. no police car followed me to check my speed. Well… probably the law also states that that’s within city borders and that i should get a receipt and my speed should be correctly measured but ok.
Well.. then it was on for the White dunes. Nothing special if you ask me, just a good excuse for renting out Quads and Jeeps. But here is a picture of the infamous white dunes anyway! The fairy stream was really cool, except for the sunburn we both got from driving and walking in the sun all day. Now it’s off to Dalat! ​Woke up at 7:00 had a brekkie. Then got to the bus at 8:30. Our tour guide and some other vietnamse passengers did some acapella songs though the bus mic. Now it’s of to the first stop: a 200 year old pagoda. The Vinh Trang Pagoda. Then went on the bus, gone to the Coconuts candy factory. Had lunch after a quick horse ride. Then saw a competitive battle of catfish catching. 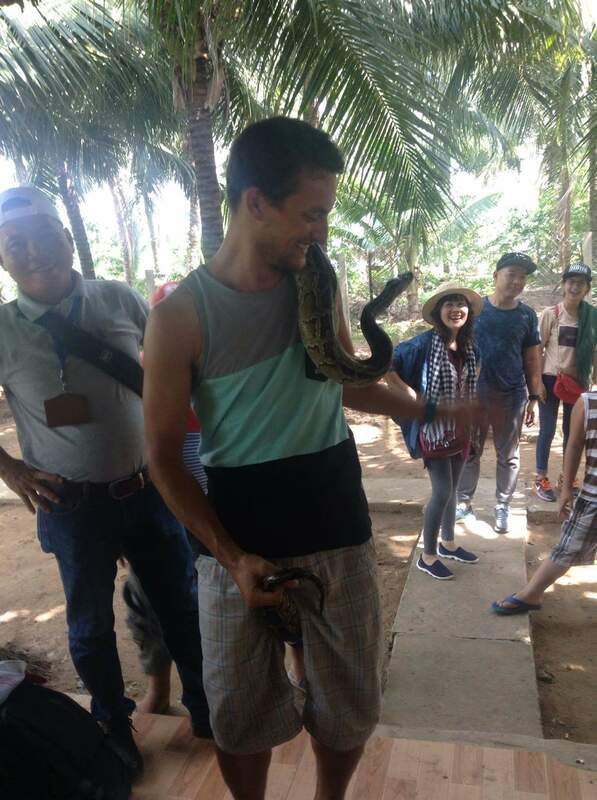 Then into another boat to go to honey tea and we held a boa constrictor. Then into the traditional canoes. 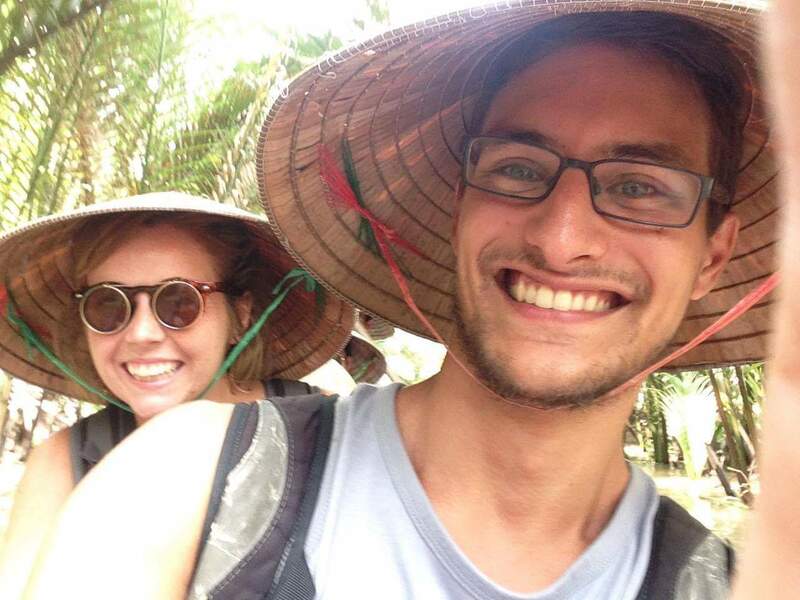 Look at these Vietnamese hats! Then we had some fruit with traditional music (our tour guide joined as well) the last song was if you’re happy and you know it… clap your hands. Back in the boat… got a monsoon on our head. And back in the bus. Then it was time for the biggest surprise of the day.. the hotel: excellent. Fast WiFi, shower and a bed! After some beers and a delicious Beef (Bó) BBQ with a lovely pepper sauce it was time for bed. 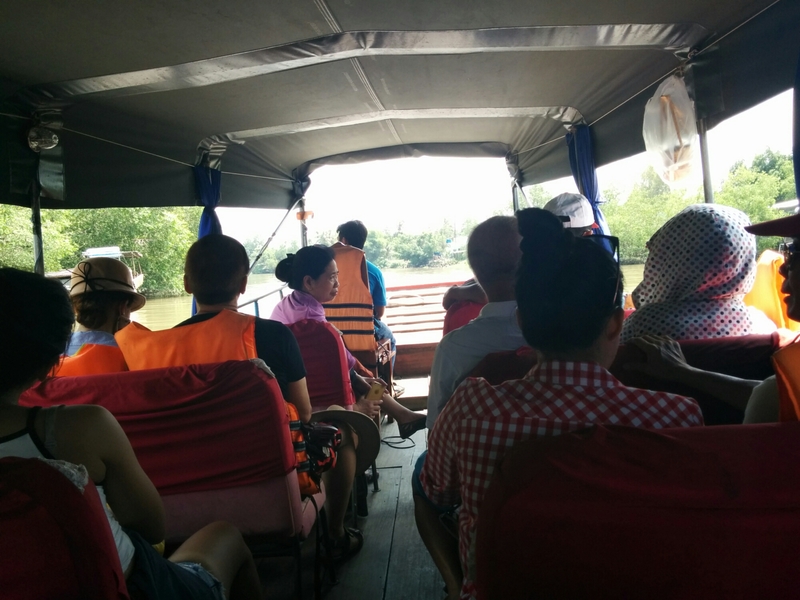 So after a short bus-trip, we got into the boat and got squashed like canned sardines… there isn’t much legroom and mandatory swim vests aren’t helping for the comfort level. After that we went to a rice noodle factory to see how they are made. They cook 80% rice powder with 20% starch, then they make a flimsy pancake which dries in the sun for 5hours then gets cut up to Noodles. Went back on the boat to go to a local restaurant/ weird farm. Where they sold frogs, rat, pigeon, snake and other local delights. But… pretty common on this trip, we weren’t really sure what we where doing from 9:30 – 10:30 early lunch?!? 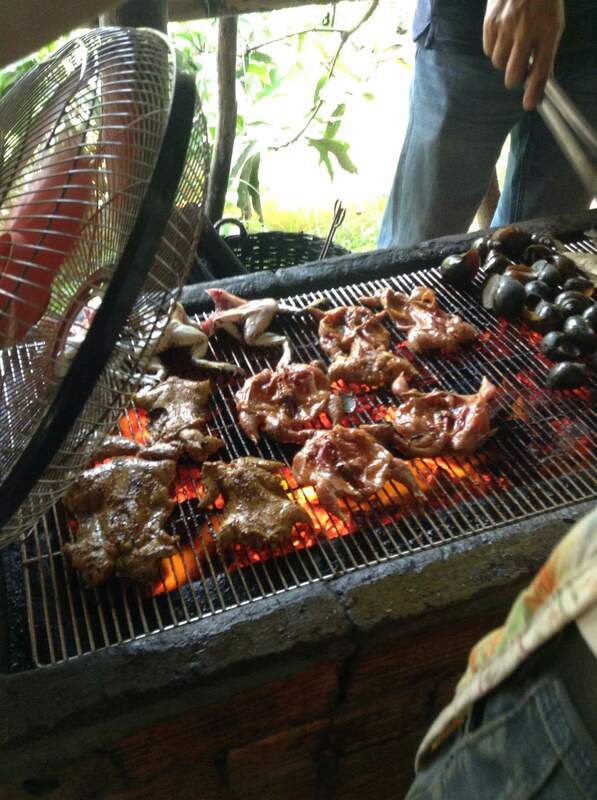 Ever tried frogs from a Vietnamese BBQ?!? Now we are Oscar Mike (On the move) again in our little snug fit boat. Now (13:00) we are on the way back to HCM city. Ready to pickup laundry and on to the next adventure… Mũi Ne!